is risograph prints (a trend that is popular among younger designers nowadays) are not the only thing that is stunning in his work. In point of fact, this ultra creative Swiss graphic designer has made a name for himself since graduating and setting up his own design studio, Feixen, in his hometown of Lucerne in 2010. Felix Pfäffli is one of the youngest designers to be newly acquired by Cooper Hewitt and his work is on display among legendary designers and other newcomers in Smithsonian Design Museum's current exhibition, How Posters Work. “He is an incredible powerhouse” says curatorial assistant Caitlin Condell.“Something Felix plays with is the scale of depth”, she adds. From book and magazine covers through posters, T-shirt graphics and custom typefaces this young man displays a creative wealth you have to acknowledge. Always adapting multiple approaches depending on the commissions his stellar body of work is boldly versatile. 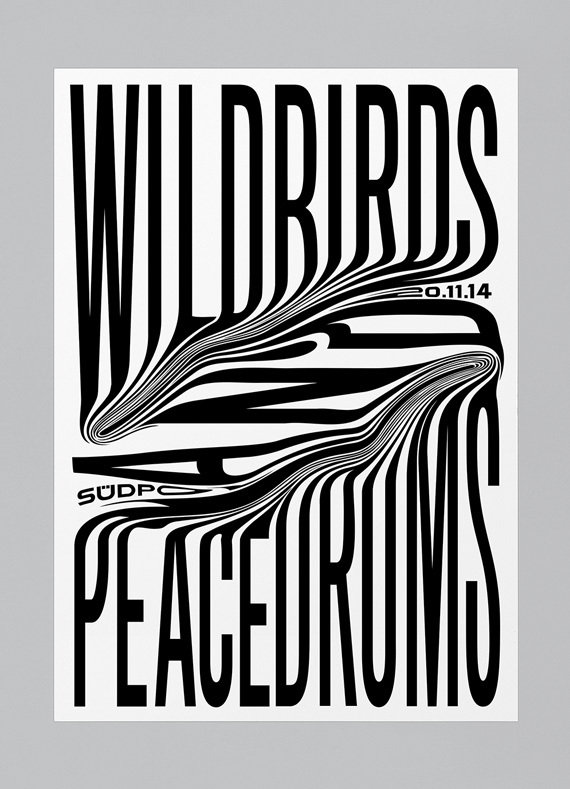 Although Pfäffli has worked on anything, his primary medium of preference is poster design with typography playing a major role in his craft. “When you’re designing a poster, there’s nothing to hide. What you see is what you get. I like that. It’s an honest medium and hugely versatile – I don’t see the poster as being solely confined to just being print-on-paper. I think the idea of a poster is just to have a limited, defined space. How big, or how it is produced is unimportant. I can well imagine that the poster of tomorrow will be animated, responsive, interactive and kind of intelligent. The whole process of how you think and work when making posters will inevitably change. Maybe we won’t even print them any more” he says to Gavin Lucas. Computer Arts magazine, WIRED magazine, Fast Co. and Etapes are some of the clients of this man of many talents, Pfäffli teaches typography, narrative design, and poster design at the Lucerne school of graphic design if he is not busy exploring new skills and techniques. He describes his style as reductive and illustrative, trying always to create images that are simple, loud and concise. “I hate to repeat myself. perhaps you could describe it as a straightforward pop with a touch of swiss tradition” he says. Smart tailoring each one of his projects, he is confident enough to push legibility to the limit. After all “it makes no sense to do things by half-measures”. This was the best advice he has ever been given and we are obliged to agree. Gurafiku is destined to become your next favorite bookmark. This is why!